One in four beekeepers has said that “if these losses continue, I cannot continue in the beekeeping business.” To help commercial beekeepers stay in business, the OBA has asked the Ontario government for financial assistance to allow beekeepers to recover and rebuild their colony numbers back to last year’s numbers. This year’s long, cold winter extending into spring was mentioned by 43% of beekeepers as the main reason for the heavy losses of colonies already weakened by last year’s poor summer weather and meagre honey crop1. 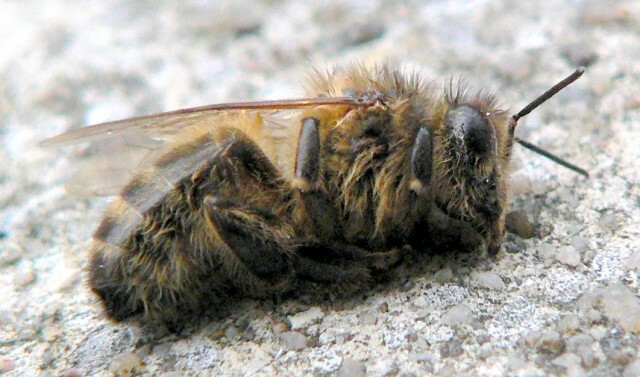 One in five beekeepers suspects pesticides as the cause of colony losses. Neonicotinoids, the most common pesticide used in Ontario, was recently the subject of an EU total ban to protect both wild and honey bees.2 3 Despite legislation adopted in Ontario to reduce their use, neonics are still being used on 75% of Ontario corn and soy crops, despite the government’s goal of reducing usage to 20%. Loss of colonies, failing queens and a slow colony build‐up means fewer colonies are available to pollinate Ontario’s fruit and vegetable crops. Honey bees are responsible for 90% of apple production.4 Almost $900 million worth of Ontario’s fruit and vegetable crops rely on bees for pollination.5 In addition to their importance for food production, pollination services are an important part of a beekeeper’s income. If we keep taking food sources away. That old saying an apple a day keeps the doctor away will not work.